Finally I have managed to use up the last of the apples that my friend Vana gave me before Christmas. 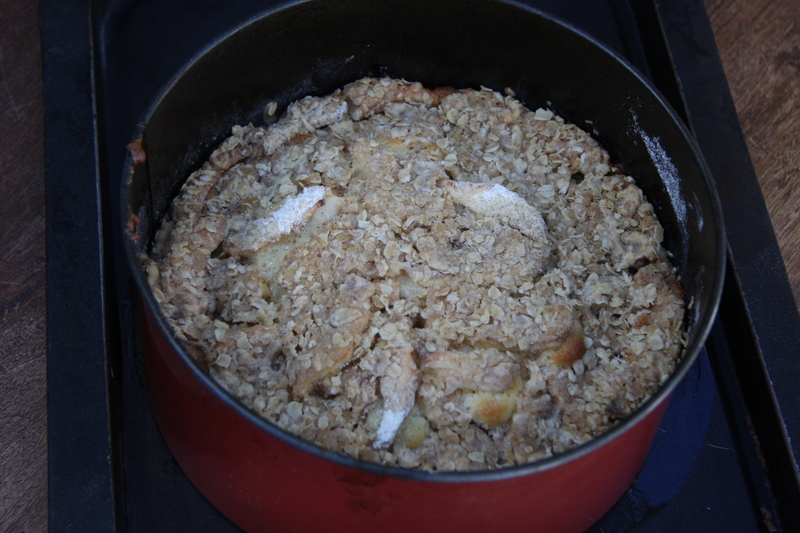 They really weren’t looking good enough to eat on their own so I thought an apple crumble, or streusel cake might be good. It’s a cross between cake and dessert and works well as either. Or both, depending on how much you have left after the first serving! I used the cake recipe from the Hummingbird Bakery “Cake Days” book but adapted their crumble recipe, partly to get some oats in there but also to reduce the amount of sugar. One of the issues I have with a lot of the Hummingbird recipes, and in particular the cupcake recipes, is the excessive sweetness. I was hoping this cake recipe might be different but I still find it a little too sweet. The original recipe calls for Granny Smith apples, which are particularly tart, and I used sweet red dessert apples instead so that might be the reason. It may just be that I am used to cake that is less sweet. I would recommend giving this a go with Granny Smith apples and if you do I would love to hear what you think. Grease, and line the base of an 8″ loose-bottomed cake tin. Use parchment paper rather than greaseproof paper if you can as it will be easier to remove. 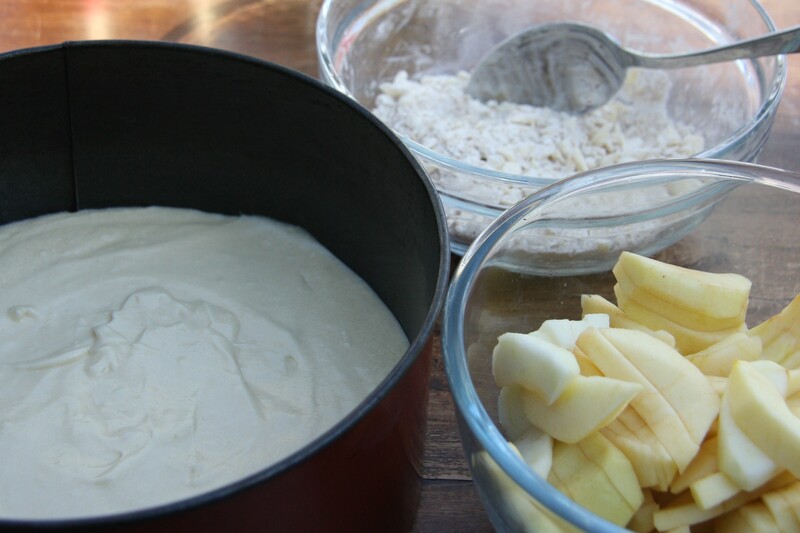 Make the topping: rub the butter into the flour until it ressembles breadcrumbs. Stir in the oats, sugar and cinnamon and put to one side. Peel, core and slice the apples and put to one side. Sieve in the flour and baking powder and fold in. Spoon the cake mixture into the cake tin and level gently. 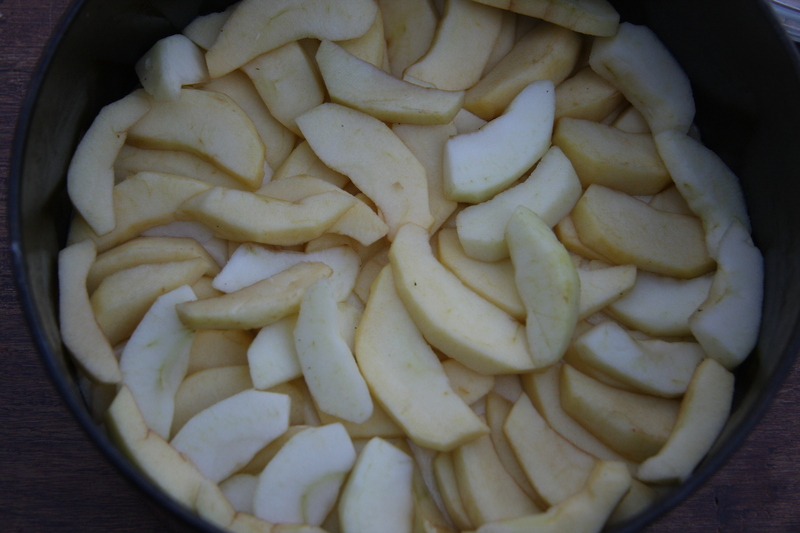 Layer the apples gently on top of the cake mixture. 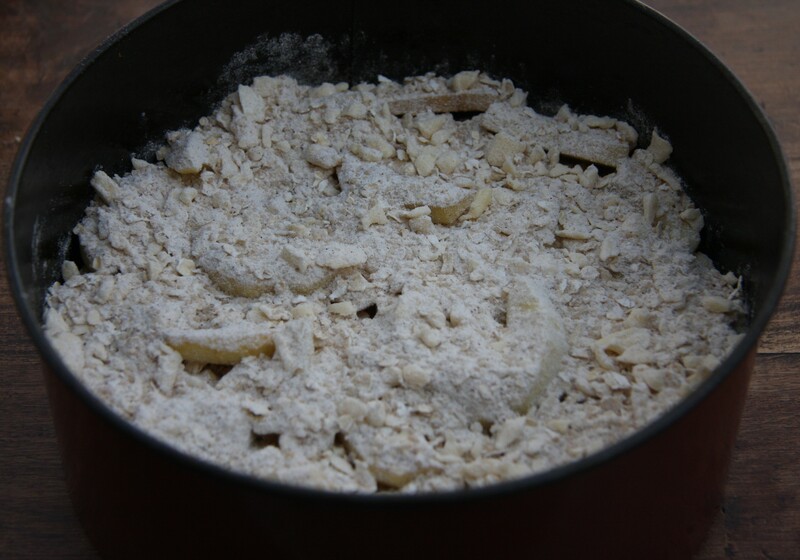 Using a spoon, sprinkle the crumble mixture evenly over the top of the apples. Do not press down. Check after about 40 minutes but the cake may take up to an hour to be cooked through. A skewer inserted into the centre should come out clean. Let the cake cool in the tin and remove carefully. It’s great warm as a dessert with cream or ice cream, and also makes a great slice of cake. We had a beautiful day here today and it was just lovely to be able to have a piece of cake and a cup of tea in the sun in the garden. It felt like the summer was on its way! Sounds yummy and thrifty! I hate wasting produce. So do I. And it’s often a good excuse for a cake! 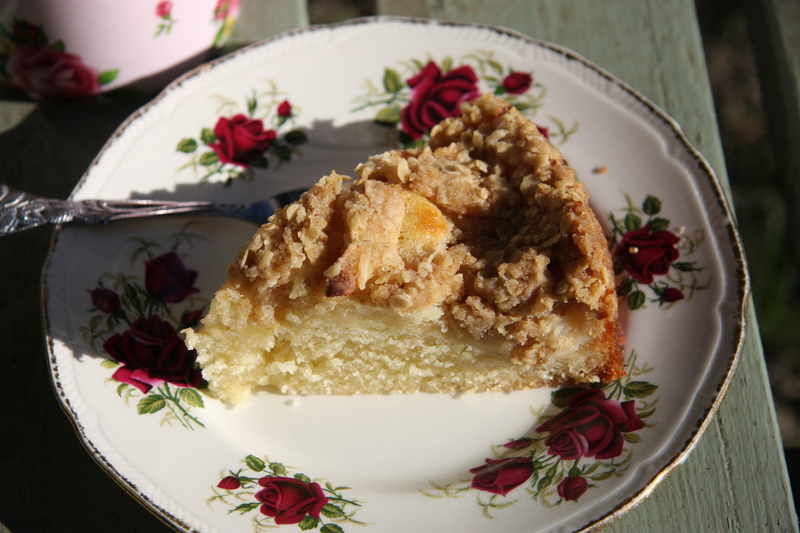 I adore crumble cakes, absolutely fantastic! Must be delicious. Thank you, it didn’t last long! Not only is that cake beautiful but that plate is gorgeous! Thanks – it’s one of my charity shop purchases and I have matching tea cups and saucers. I buy them whenever I see ones I like but am running out of space to keep them! 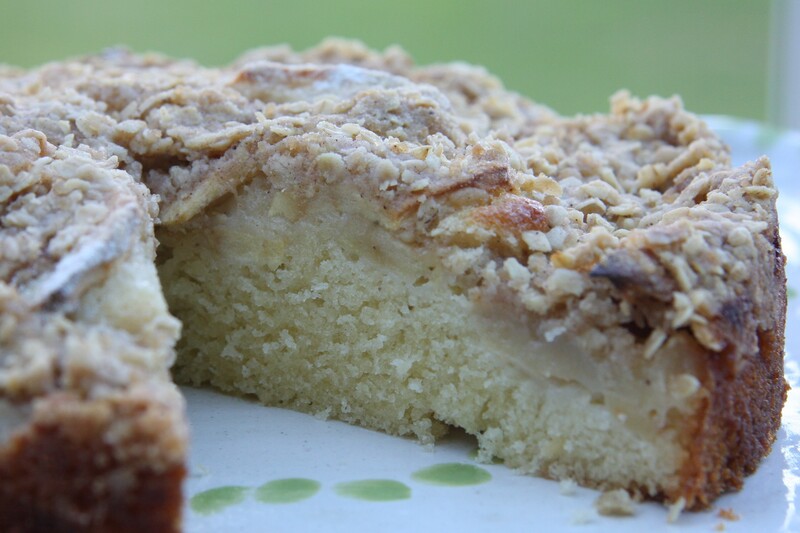 I love crumble, I love apple cake …. that means that I’m totally in love with your cake! You can’t beat apple crumble. Or cake!